The Central Florida Community Orchestra is proud to present their newest, can’t-miss concert experience! Epics and Origins is an exciting evening of thrilling film scores and some of the classical pieces and composers that inspired them. The concert is sure to be an edge-of-the-seat event for every music lover in your family as we explore the relationships and influences between renowned Romantic-era compositions and the epic film scores of today’s great composers like Danny Elfman, Howard Shore, Hans Zimmer and John Williams. Conducted by Justin Muchoney, Epics and Origins is Central Florida Community Arts; orchestral highlight of the season, showcasing over 60 orchestra members! Mark your calendars now for Saturday, November 17th! 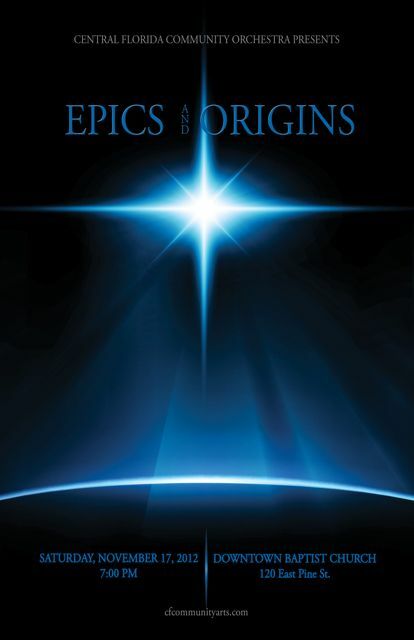 Epics and Origins will only be presented once – 7:00pm at Downtown Baptist Church, so don’t miss this chance to be amazed by some of the most powerful music ever written!